I will be working in stop-motion animation. The point I have chosen is the cabin which switches tracks. 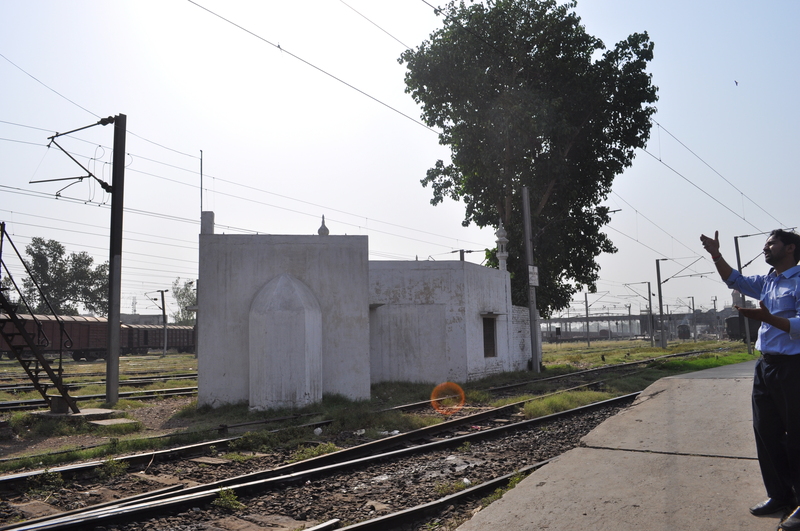 right next to it, between the tracks is a small white mosque. Now making a mosque in the middle of tracks is quite unusual but it has an aura of silence against the noisy and busy background. Also, this little white structure stands in the middle of the browns and greens and other colours of the busy railway station. For me, the mosque is the presence of hope in the midst of all the fares of the quotidian. Almost like a white lotus standing in a swamp. The track changing cabin which is accessed after climbing a creaky flight of stairs made during the colonial times brings the human attempt to run things in order, while the little white mosque down the steps gives a silent prayer to retain our faith in ourselves and our sense of control on the future… (Ancient Greeks believed that hope gives a false sense of control on the future and argued its positivity). ‘For the project i have taken footage from the point and will now work in making Experiential Orbs as a piece of slice.these orbs will be made in round and will have visual, auditory and textural pieces from different points of my designated area. so the idea is the i am breaking my slice down in smaller points of my interest. Its like taking different scoops out of the point. The orbs are sculptural and in round. Sketches of these orbs are still in process.